Description: Schofield planned to advance inland from Wilmington in February, while concurrently assigning Maj. Gen. Jacob Cox to direct Union forces from New Berne (present-day New Bern) toward Goldsboro. 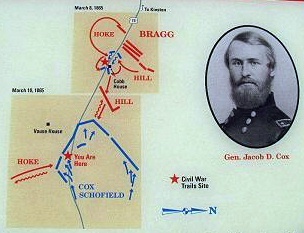 On March 7, Cox’s advance was stopped by Hoke’s and Hagood’s divisions under Gen. Braxton Bragg’s command at Southwest Creek below Kinston. On the 8th, the Confederates attempted to seize the initiative by attacking the Union flanks. After initial success, the Confederate attacks stalled because of faulty communications. Recommended Reading: Bentonville: The Final Battle of Sherman and Johnston (Civil War America). From Booklist: In March 1865, the Confederacy was dying, and Sherman's army was marching into North Carolina. Joseph Johnston made one last, desperate effort to halt the advance of an army three times the size of his, and on March 19 surprised one wing of Sherman's forces. A single Union corps very nearly won the battle all by itself, however, and when reinforced, drove off the attackers, inflicting heavy casualties. Hughes' excellent battle monograph is oriented toward the scholarly reader but accessible to the general one. Its particular strengths include verbal portraits of many leaders on both sides and eloquently understated descriptions of whole Confederate brigades going into battle with barely the rifle strength of a healthy company. A desirable addition to Civil War literature. Includes 9 maps.